An informative video for New York’s Japan Society about its history and activities. Narrated by famous Japanese Kyogen stage actor Mansai Nomura. Dutch financial company ING Group has launched a new brand positioning, World, Here I Come, in Amsterdam Airport Schiphol. As part of the campaign, ING created a series of Cities In A Click posters which offers travellers useful information to key travel destinations before they board a flight. Ten local artists from each of the ten cities created an illustration that reflects their city. ING also worked with Lonely Planet to ensure each one provides insightful suggestions and tips. The featured locations are Hong Kong, Shanghai, Tokyo, Istanbul, Frankfurt, London, Madrid, Milan, Paris, and New York. Love the idea. No spots from Africa, Oceania, or South America though. 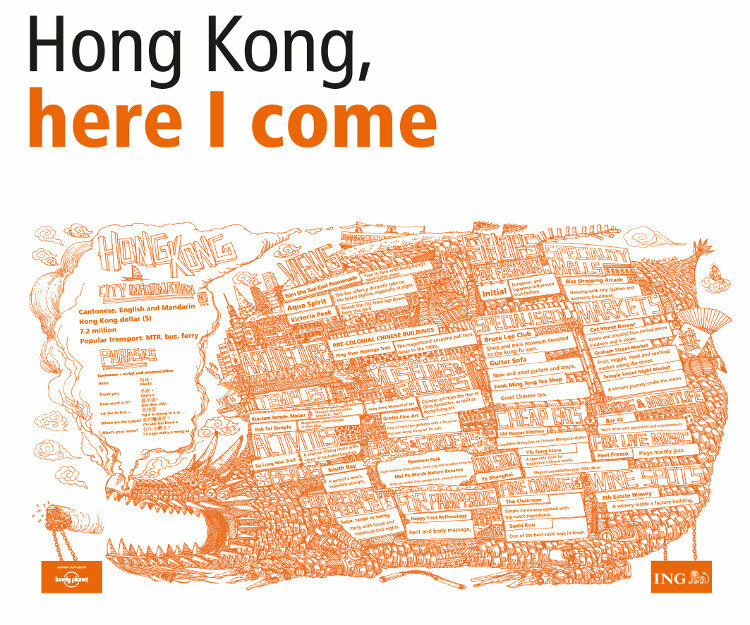 Perhaps those regions are not “key” destinations from ING’s perspective, but these multinational corporates need to show more sensitivity when making a global marketing campaign. Click picture for larger size. Korean-American actress Han Ye-seul in November 2014 issue of Cosmopolitan Magazine [Kr]. Photos taken in the streets of New York, in collaboration with Korean handbag brand DÉCKE which she endorses. Chinese actress Liu Tao in latest issue of OK Magazine [Cn]. Photos taken in New York, presumably when she was in the city for the fashion week in September. Video of a cool interactive billboard by clothing retailer Forever 21 in New York Times Square. Tech firm Wildbytes and ad agency space150 made this for the opening of F21 flagship store in 2010. Claimed to be the first interactive billboard in Times Square, it features a series of larger-than-life models who interact with the crowds in various ways. This video was from 2012 but AFAIK the billboard is still there, bet it’s pretty popular with tourists and visitors. Famous Japanese competitive eater Takeru Kobayashi goes undercover at Buffalo Wild Wings as he pranks the New York Cosmos (soccer club) and midfielder Peri Marošević into a chicken wings eating contest. Nice one for April Fools. French footballer Thierry Henry in January 2014 issue of American GQ Magazine, donning some French-style suits while enjoying his leisure time at the streets and bistros in New York City. The sport star is currently playing for the New York Red Bulls in Major League Soccer. Full interview on GQ.